Absalom Jones was an African-American abolitionist and clergyman. 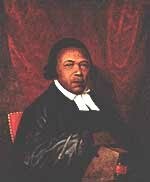 After founding a black congregation in 1794, he was the first African American ordained as a priest in the Episcopal Church of the United States, in 1804. He is listed on the Episcopal calendar of saints and remembered liturgically on the date of his death, February 13, in the 1979 Book of Common Prayer as "Absalom Jones, Priest, 1818".